Nora: It was a wolf. Not a professional assassin or mercenary. Just some petty thief trying to take advantage of a couple of isolated humans. Nora: The first arrow was for Saria. 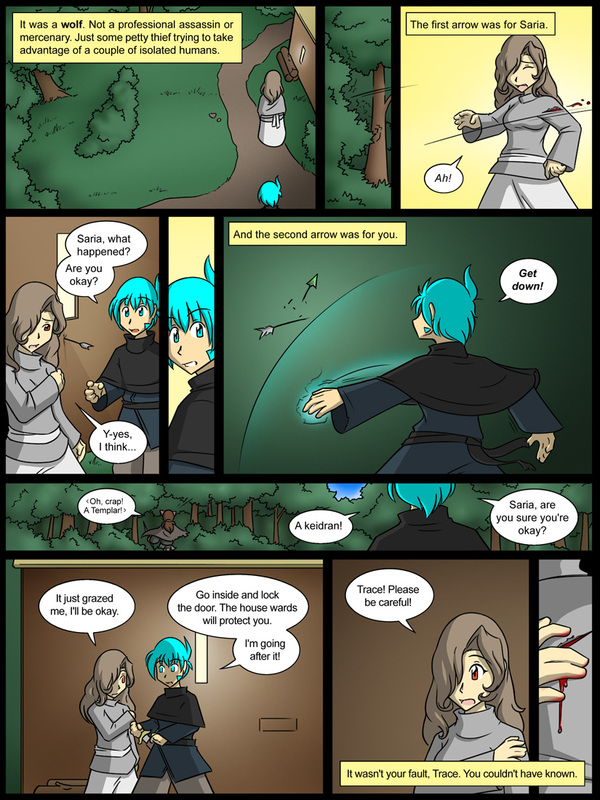 Trace: Saria, what happened? Are you okay? Nora: And the second arrow was for you. Wolf: (in Keidran) Oh, crap! A Templar! Trace: Saria, are you sure you’re okay? Saria: It just grazed me, I’ll be okay. Trace: Go inside and lock the door. The house’s wards will protect you. I’m going after it! Saria: Trace! Please be careful! Nora: It wasn’t your fault, Trace. You couldn’t have known.